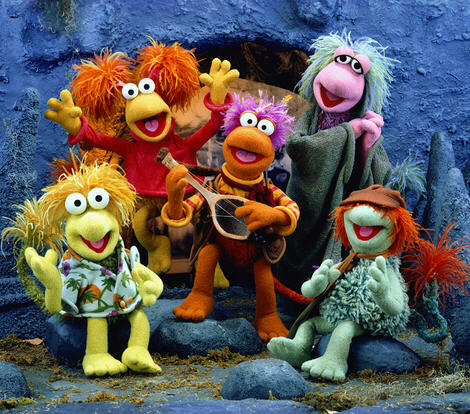 Kryptonian Warrior: Fraggle Rock Movie Rights Acquired! It's being reported that 'New Regency' has just picked up the movie rights to Jim Henson's popular TV series 'Fraggle Rock'! Me and the missus are HUGE Fraggle Rock fans, and if you're a regular visitor to this blog then you already know that I love all things Henson created, and Fraggle Rock is no different. My single worry is that New Regency are the production company that brought The Chipmunks back into our lives, but then that franchise has actually done really well for them and my kids love the first two movies and can't wait for the third, so something went right. And of course The Smurfs have made an immense comeback recently too, so I'm hoping this will be a successful return for our favourite cave dwellers! New Regency today acquired rights to turn the Jim Henson series Fraggle Rock into a feature film. The property was shopped and caught the interest of studios, before New Regency made the deal for a film that will be produced by The Jim Henson Company and the Montecito Picture Company. The series premiered on HBO in 1983, ran for five seasons and was broadcast in over 80 countries. It revolved around puppet characters Gobo, Wembley, Mokey, Boober and Red, who lived in Fraggle Rock. They interacted with humans who thought they were aliens. The Alvin And The Chipmunks franchise has been lucrative for New Regency, and this was an opportunity to add another family film franchise. It is not immediately clear whether the film will use puppets or be a CG/live-action mix. New Regency and the producers are figuring that out now and will set a writer shortly.